Off-page SEO, content optimization and consultancy for italian luxury property agency LERE. SEOgrad have been doing off-page SEO campaign for the main website in the Russian web including backlink building, publishing articles with ancor text backlinks and social accounts management as well. 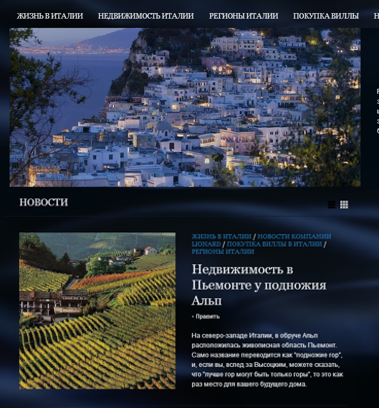 Together with some minor advice on pages optimization we also offered setting several company blogs in the Russian language to attract more visitors interested in establishing a second home or moving to Italy. The blog is set on WordPress CMS by the main website developer in Italy , then customized and SEO-ed by our specialists. The blog covers various topics starting from issues on geography, attractions or cuisine to the living conditions in various regions of Italy or such things as property taxes or new estates on sale. The blog is supported by a twin blog in popular Russian livejournal.ru service and has an aggregated RSS feed via Feedburner and Yahoo Pipes to cast embedded headlines. Articles in the blog link to the pages of the main site with relevant properties according to the keywords placed and are crossposted with a backlink to the article at Vkontakte.ru, Twitter and Facebook pages. Texts for the articles are original and are partly translated from English or Italian and SEO-copywritten according to the keywords list relevant to the desired queries.